The Harry Crisp Award is given annually to students at Camberwell College of Arts to celebrate work made in partnership with, or focussing on, social impact and local communities. Funded by the Camberwell Residential Academic and Fellowship Trust (CRAFT), which funds projects that bring together arts education and local communities in the Camberwell area including the Open House event which takes place at Camberwell on the last day of the Undergraduate Summer Show. The deadline for applications for this year’s prize has now been extended until Monday 22 May, so students who have worked with local communities this year are encouraged to apply and win £500. We caught up with last year’s winner, Grace Pappas, who graduated from BA 3D Design in 2016, about how winning the prize impacted her practice and what she has done since leaving Camberwell. Image of Sickle Cell Educational Toy by Grace Pappas and Jonathan Morris for which they jointly received the Harry Crisp Award for community-focused design in 2016. How did winning the Harry Crisp Prize last year impact your work? The Harry Crisp Award made me more conscious of the society-oriented strands of my work. Being within such a crafts-oriented university like Camberwell made it difficult for me to notice some of the strengths of my practice which relied more on the concept and the sociological research. The award not only offered a different platform from which to view my work but in a way it also justified my position in the discipline. Can you tell us a bit about the project for which you received the prize? It is a project that I started in collaboration with Jonathan Morris for King’s College Hospital’s department for Sickle Cell Anemia. Through our work with them, we were briefed on some of the challenges which faced the medical practitioners during the treatment of their patients. 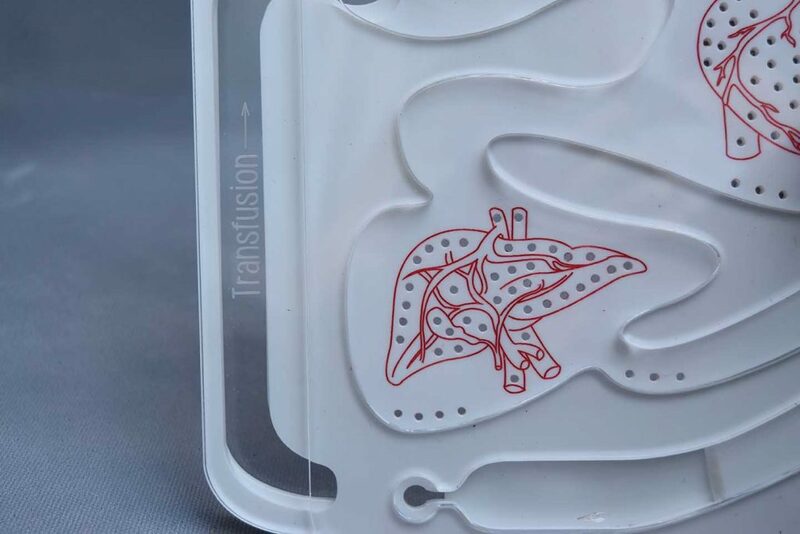 As a response, we made a toy simplifying and explaining to children what happens to their bodies after multiple blood transfusions and how their medication helps to keep them healthy. 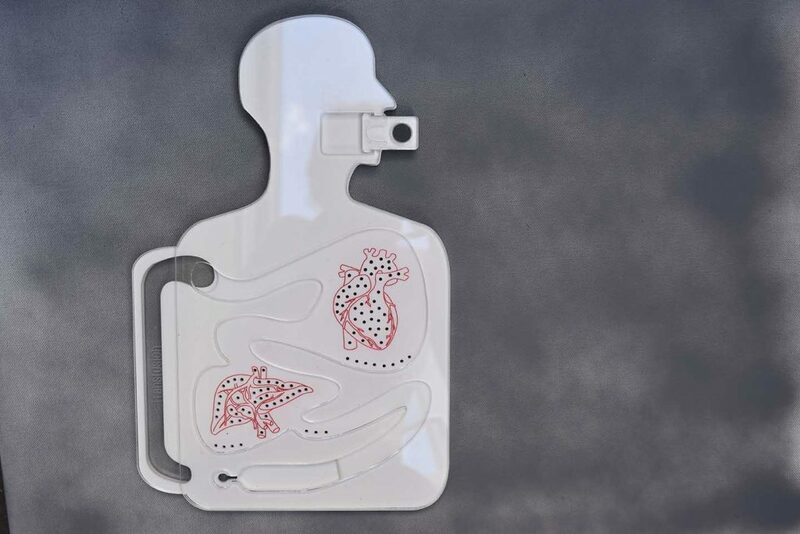 Detail image of Sickle Cell Educational Toy by Grace Pappas and Jonathan Morris for which they jointly received the Harry Crisp Award for community-focused design in 2016. Have you continued the work that you won the prize for since you graduated? Have some of those same interests carried forward into your practice today? Even though my focus has shifted away from product design and more towards interaction design, this is a project we really believe in so Jonathan and I are still actively looking for ways of pushing it forward. We want it to reach more of its intended audience. That aside, there are some underlining principles that connect the Sickle Cell Anemia toy to the rest of my work since, such as my focus in critical anthropological research and communication. Please tell us about what you have been doing since you left Camberwell. Following the Summer Show and New Designers, I started a masters degree at the Royal College of Arts called Information Experience Design. It is a new course that focuses on the human experience in today’s world. It is an amazingly liberating environment that supports individuals to find their own path and I am so grateful for being there. I have experimented with a great variety of projects and people that I would have never imagined possible. 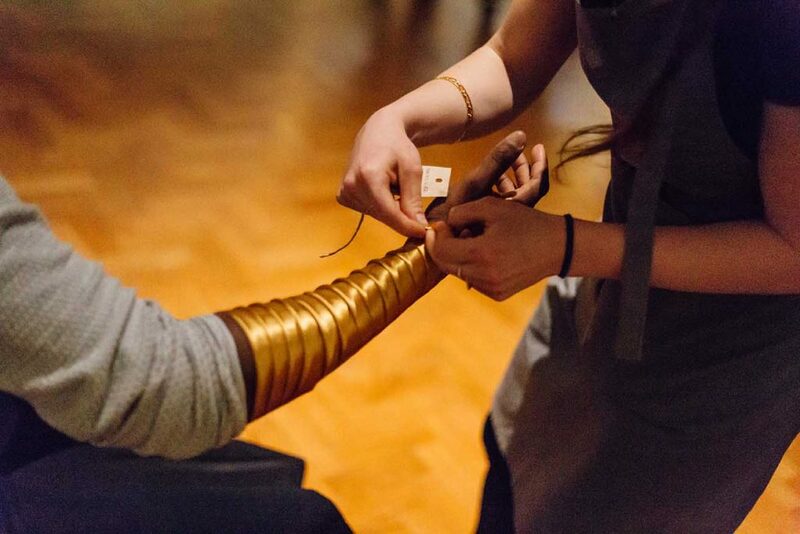 Image of recent work by Grace Pappas at the V&A museum in London with Oscar Warr and Albert Arbu. Personally, I focused mostly on projects around the perception of time and space and around narrative-building. I also produced some materials and engineering-oriented projects. For example, for one of the projects we created a performance about gender roles in collaboration with people from RCA and some transgender actors. It was a response to Virginia Woolf’s book, Orlando, and it will be presented this summer in a show by the theatre company Clay & Diamonds. I also recently presented a project at the V&A museum in London with Oscar Warr and Albert Arbu, as part of the museum’s Late event last month. 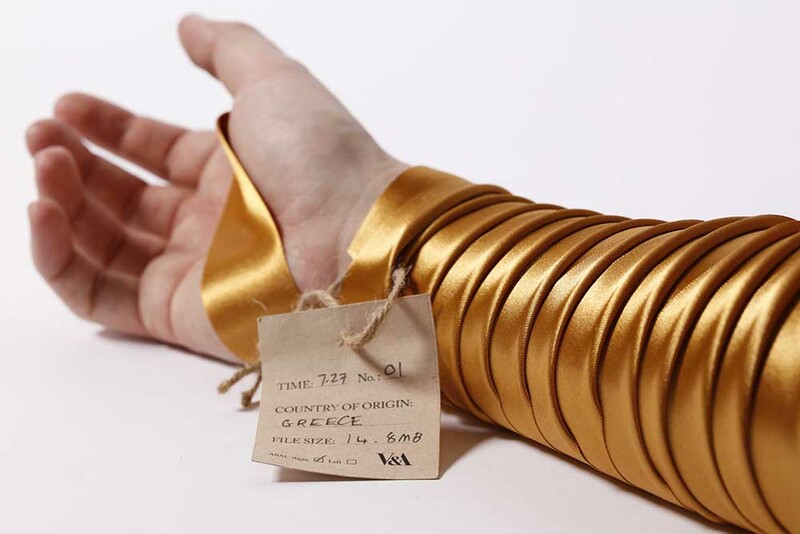 For this, we selectively 3D scanned the hands of nine people and then wrapped them with a golde ribbon to signify that they had become part of the museum’s the digital collection. The aim of the project was to question what is considered valuable in a museum collection. Why would you recommend students this year apply for the Harry Crisp Prize? I believe it is a great opportunity to just test a different environment within which a project can be understood. The committee of the award might not be aware of your project before seeing your proposal and you are called to make a persuasive argument about it in a limited time/space. That on its own is a very valuable creative exercise that all practitioners will be faced with in the future. Art and design are deeply rooted in the communication of your concepts and you should be taking advantage of every opportunity to train for that. I am not entirely sure and to be honest I am really enjoying leaving it like that! For the time being, I will be doing my best with my master’s degree that will continue for another year. I know I have to focus on my thesis and some independent projects that will be presented in the next couple of months. After that, I will be following any interesting opportunity that comes my way and seeing where it can lead me. I feel a particular pull towards museums, education, crafts, nature and travelling so I will probably end up experimenting with opportunities around these areas. Applying for the Harry Crisp Prize 2017 is easy. Simply send an email giving your name, course, contact details (must include email address and mobile phone number) and in no more than 200 words demonstrate why you should be awarded this prize. You will also need to submit an external letter of support (or reference) from relevant local community group. Emails need to be sent by no later than Monday 22 May 2017 to j.vine@arts.ac.uk . The Award winner will be announced at the Camberwell Degree Show during the special Prize Winner’s Event on Monday 19 June 5-6pm in Camberwell Canteen. Find out more about Grace’s work on her website. Find out more about our Summer Shows.